Now is the ideal time to schedule a tax planning session. 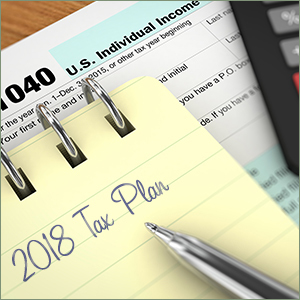 Your 2017 tax return outcome is still fresh, and it's early enough in the year to take advantage of the numerous tax law changes taking place in 2018. Here's a brief overview of some of the new tax issues that you need to plan for now. Tax rates for both individuals and small businesses have changed substantially. Income tax deductions have also changed drastically, including a nearly doubling of the standard deduction and elimination of personal exemptions and miscellaneous itemized deductions. It's important to review your income tax withholding schedule to see where you fall in the new income tax bracket structure. Small adjustments here could save you hundreds. Because of the changes to the deductions structure, using itemized deductions may now require bunching two or even three years of expenses into one tax year. Things like donations to charity and medical expenses that you may have spread across several years are now better bunched into a single year to maximize your tax savings. If you typically take care of medical expenses or charitable donations at a regular time every year, hold off this year until you have a new tax-efficient plan. There's now a $10,000 combined total cap on deductions of state and local income, sales and property taxes, which is going to impact a lot of people, especially in high-tax states. This may be a big factor to account for if you've relied on this deduction in the past. Get an analysis done to see how much larger your tax bill is going to be because of the cap on SALT taxes. There may not be much you can do about it, other than changing where you live and own property, but you'll need to have a clear picture of how it will impact your tax return in 2018. There are several new rules changing how mortgage interest is deducted. You can no longer deduct the interest on mortgage indebtedness greater than $750,000. And you can no longer deduct interest on mortgage indebtedness that wasn't spent directly on buying, building or substantially improving your home. If you have previously claimed a home equity loan interest deduction, you'll need to review how this will affect your itemized deductions. These are just a few examples of things that you'll need to review in the wake of the largest tax law change in more than 30 years. Take some time this summer to make sure you have a plan in place.